This is a full auto Expert Advisor. It detects sup/res for recent candles and draws two HLines and then if breakout occurs from these HLINEs, this EA trades it successfully just once a day. It is more recommended you draw yourself these sup/res Hlines. Don't worry and believe that you are much smarter than any EAs to draw support and resistance lines. Trade_Daily_once : False ; // If you want a safe trading turn this to true. AutoDraw : True ; // If you want to draw yourself then use False. AutoDrawTime : "10:00" ; // If you disable AutoDraw by setting it to False, then this parameter is useless. AutoDrawCandles : 8 ; // If AutoDraw is enabled then, this EA looks for recent <n=AutoDrawCandles> Candles. RiskAmount : 4 ; // in US Dollars you indicate how much money you are ready to lose if StopLoss hits. 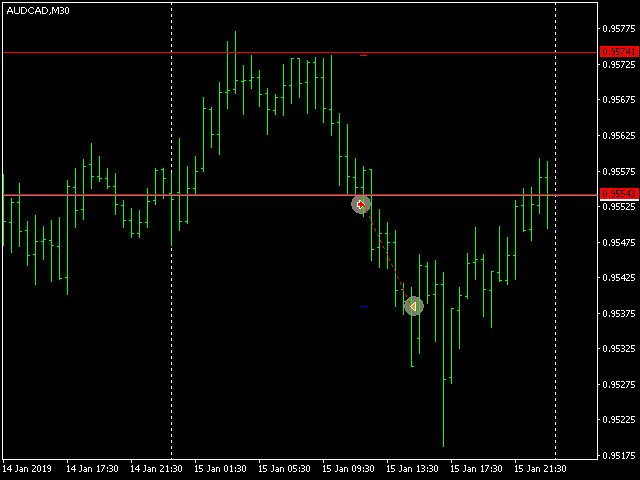 rr_ratio : 0.8 ; // Risk/Reward ratio, 0.8 means if SL is at 10 then TP is at 8 US Dollars. The three parameters AutoDraw, AutoDrawTime and AutoDrawCandles relate to drawing Hlines automatically. It means when EA detects the open time of a current candle is equal to 10:00 o'clock, then looks back for 8 candles highs and lows and draws two Hlines. If Trade_Daily_once is set to false then the AutoDrawTime (which limits the number of trades once per day) will not be considered. SL would not be greater than one and half times of the RiskAmount. Also after opening of the trade by EA, you can edit manually TP and SL. Please kindly consider that if price jumps suddenly escaping from Hlines, then this EA may fail to open a trade. This is to guaranty a secure trading.